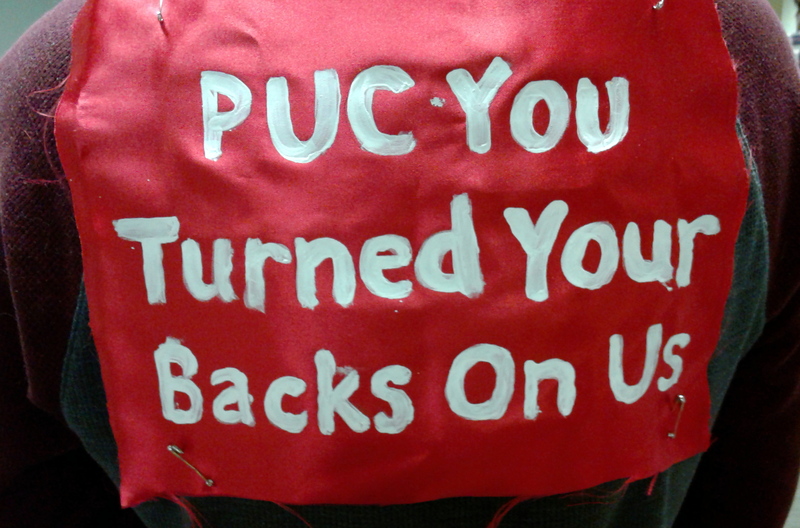 Water Protectors kept their backs to the PUC throughout today’s hearings, with messages pinned to their backs. 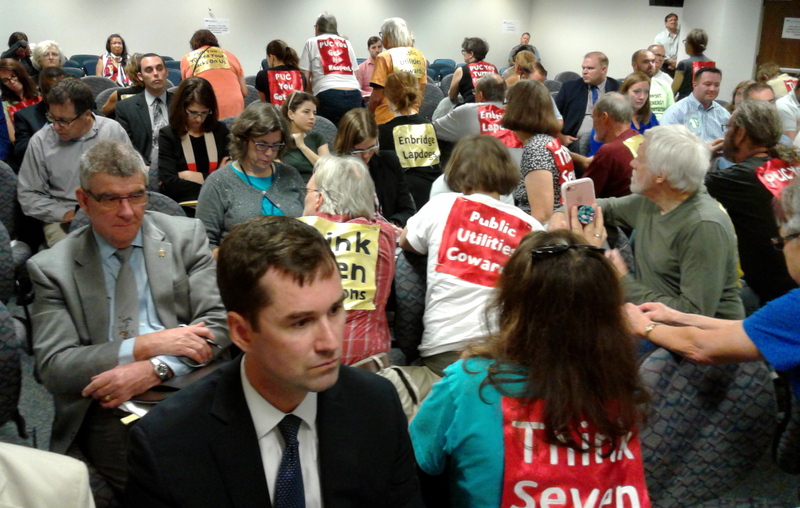 Water Protectors interrupted today’s Minnesota Public Utilities Commission (PUC) meeting, keeping the Commission from a vote allowing the Enbridge Line 3 tar sands pipeline to move forward. It’s a sign of the escalating tension and resistance to the project and the Commission’s ill-considered vote. The PUC voted in June to approve Line 3’s Certificate of Need and Route Permit, but it also put five conditions on its approval. These conditions included financial guarantees and insurance requirements to assure that Enbridge had the financial capacity to clean up a major spill in Minnesota. The PUC required Enbridge to submit a detailed plan to meet these conditions; today’s meeting was set to discuss these plans. Monday’s hearing quickly dove into the deep legal weeds with questions about whether Enbridge’s financial assurances were strong enough, or whether Enbridge was trying to craft some legal loopholes to make the agreement more difficult to enforce in the future. Representatives from the Minnesota Department of Commerce raised their own going concerns about Enbridge’s proposed language. Honor the Earth has a motion before the PUC to force Enbridge to release the details of its insurance coverage, something Enbridge claims is protected as a trade secret. Good. It’s about time people stopped tolerating the constant rollovers of the MN PUC.